Even though I have them both for quite some time, today was the first time ever I did a direct comparison. The Moon was visible from within my city (Cologne), today it's 10th day after New Moon, so I started with the Vixen. As the seeing was surprisingly steady, I then decided to also set up the C5 next to it. Vixen SP-90M (white) from around 1985-87, all original. Celestron C5 Classic (white) from around 1993-99, all original. Baader Eudiascopic 20mm + 7.5mm, Vixen Plössl 10mm, volcano top Ortho 7mm. I keep a Celestron 1 1/4" prism diagonal for both of these scopes. In both scopes I changed back and forth mainly between the 10mm and 7.5mm and went along the terminator. I eventually concentrated on the crater Gassendi which was exactly on the terminator. The central mountains were barely lit by sunlight; one of the mountains – the one closest to the terminator – was just a tiny bright dot. This crater is known for all the ridges and rilles on the crater floor; however all that was still pitch black tonight. The 20mm I only used to find and center the Moon. However it presented a nice full view of the Moon in both scopes. I really liked how the Moon filled out most of the field of view especially in the C5. The slight difference in f/l ratio was readily visible at the eyepiece. The 10mm in the C5 (exit pupil = 1mm) was a bit brighter and mouches volantes even further reduced, compared to the 90M (exit pupil = 0.9mm). Same goes for the 7.5mm. To my eyes, it was a bit easier in the C5. Actually I was surprised at how well the C5 kept up. It was in fact much more enjoyable to watch the moon at 125x with the 10mm (1mm exit pupil) in the C5 than in the Vixen at 133x with the 7.5mm (0.7mm exit pupil). When I then placed the 7.5mm (or 7mm) in the C5, I first thought that I'd have come close to its limits – but in fact it was just the seeing; in those moments of best seeing the lunar details presented themselves with absolute clarity and sharpness at 167x–178x. So, both scopes could very easily manage all the magnifications. There was no real difference in perceived sharpness. Both scopes were able to show similar details in the central mountains and along the rims of Gassendi; but obviously aperture wins. The sun-lit peak of the central mountain closest to the terminator was a strikingly bright and crisp light point especially in the C5. There's also a long ridge that starts at the crater walls and then spreads around Mare Humorum. The short part of that ridge that was lit by the sun tonight also seemed brighter and kind of "crisper" in the C5 than in the 90M. In the end I'd have to give the nod to the C5 when it comes to the absolute amount of details visible. Speaking of tube/local seeing, the C5 was more affected and views in the 90M more steady, but the difference was small. But at 13°C (55°F) local temperature it wasn't a really cold evening (two days ago it was much different!). Maybe under different circumstances, the C5 would have more trouble with that. False color: The 90M showed a blueish/purple rim around the Moon, and – depending on fluctuations in seeing, your eye position etc. – also some dark purple haze in deep shadows next to bright, sun-lit details at the terminator. The C5 didn't show any false color; only when I moved my eye well out of the optimal viewing position some was visible which is caused by the eyepieces (I guess). Overall, I would say today the C5 beat the 90M on the Moon tonight. It's bigger aperture totally outweighs any inherent disadvantages of the SCT design. It also reminded me why I wanted a C5 in the first place – it's still small enough to deliver decent "medium-high" power views without the sometimes endless cooling times of the C8 or also several Maksutov scopes. I am sure that with according eyepieces the 90M would have even handled 200x or more pretty well, maybe even better than the C5 would – but as I dislike these small exit pupils so much, I don't bother anymore to even try that out. I also have a C5 I like to use on the moon. I think it’s a wonderful scope for that purpose. Regarding your focuser, there is something you might try. I don’t know if this applies to older C5s, but on the newer ones there is a rubber covering on the focuser knob. When I got my scope that rubber covering was pushed in very tightly so that it was sticking in the hole and rubbing. Pulling it out a little did help. Good luck looking at the moon! I wish you clearer skies than we have here. So it's not a rubber covering ... think the scope is too old to have that. I read that the central obstruction of mirror scopes isn't a big problem when most details have a really big contrast, as is the case on the Moon. Maybe that also explains why the C5 impressed me so much yesterday. I didn't use it for quite some time – in fact I think the last time I had used it before yesterday was for the famous lunar eclipse in 2018. Here's a pic from yesterday (just the iPhone on the 7.5mm Baader eyepiece). 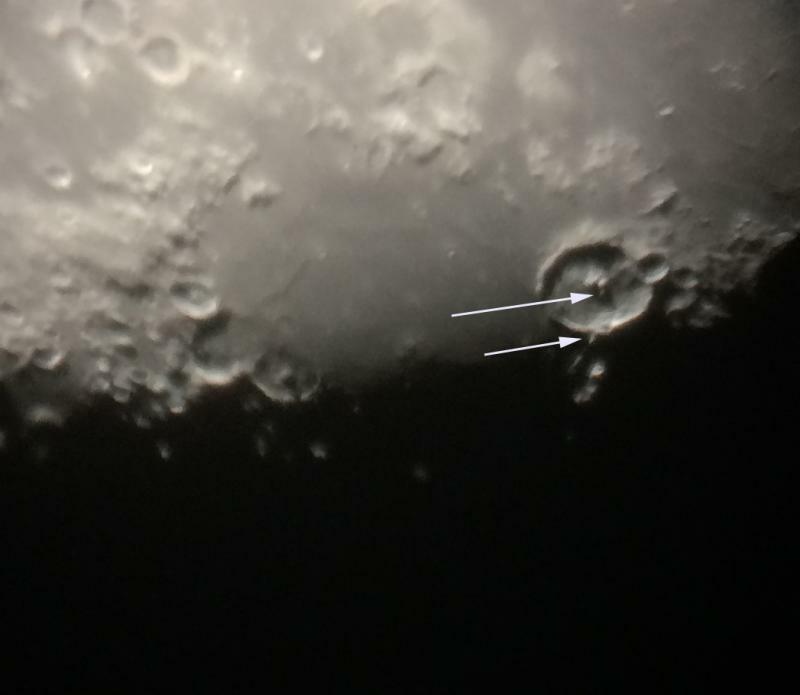 I inserted the two arrows to two details in the crater Gassendi that both scopes showed beautifully, but in the end the C5 made them stand out even more clearly to me. As always, these simple iPhone pics don't match the beauty of the visual experience, of course. It's hard to capture the experience with a camera, it's true. If you get that focuser fixed, I'll tell you a trick I saw on another thread here. You take a zip tie, and you fasten it around the focuser knob. The zip tie sticks out sideways, and you use your fingertip on the ziptie. It makes it like a fine focuser. It makes the mount shake much less, and lets you make much smaller adjustments to focus. I've found it very helpful. Just remember not to tighten it so much you can't remove it from the focuser. I have found that a central obstruction seems to matter little on high contrast targets. Saturn in my Meade 2045, 4 inch SCT is bitingly sharp and rivals the views in my similarly sized refractors. On Jupiter, though, the contrast loss is apparent and my 75mm, F/15 achro gives a nicer, more detailed view. On Saturn, the moon and double stars my little SCT leaves little to be desired and reveals just about all any 4 inch optical system can on these targets. I continue to be amazed by how much performance is packed in such a pint-sized package! The 2045 is another one of my childhood dreams. I loved those three table-top legs, just like the first ETX90 also had. One curious thing I forgot to mention in my first post: So I have two Eudiascopics 20mm + 7.5mm and the Vixen 10mm. They all three are homofocal in my Vixen 90M. It's really nice that the view stays in focus after changing the eyepiece! But in the C5, they are not. I have to adjust focus between any of these three eyepieces. Cannot really figure out why that is.